We are offering our clients with a qualitative Lever Handle. Manufactured using superior quality raw material procured from the reliable vendors of the markets, these offered products are in compliance with the defined parameters of the industry. Furthermore, to meet divergent demands of the clients, we offer these products in different sizes and specifications. Founded in the year 1976, we, “Agrawal Metal Works”, are ISO 9001:2008 certified firms engaged in manufacturing and exporting a premium range of Hardware Fittings. 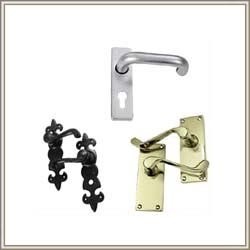 Under this range, we offer Door Hardware, Door Hinges, Door Hooks, Door Knobs, Door Knockers and Door Pulls. Along with this, we offer Window Hardware, Cabin Hooks, Case Fasteners, Casement Stays, Sash Lift & Sash Rings and Lever Handles. Further, we offer Cabinet Knobs, Cabinet Pulls and Drawer Pulls. In addition to this, we offer, Hand Forged Iron Fittings, Curtain Fittings and Stair & Carpet Brackets. Manufactured using superior quality raw material sourced from the reliable vendors of the market, these products are designed in compliance to international quality standards. These products are highly appreciated by the clients for their longer service life, easy operation and excellent performance. We are backed by a highly skilled and competent team of professionals who plays a vital role in our organization. These professionals manufacture these products by using excellent quality raw material, sourced from trusted vendors of the market in accordance to international quality standards. Further, our team of quality controllers stringently tests these products on various parameters to ensure excellent flawless range of products. Owing to their superior quality, excellent performance and longer service life, these products are highly demanded by the customers.